Polamar Skies - Milky Way Over Palomar | Astro What? Astronomer Iair Arcavi comes to Palomar Observatory to use the Hale Telescope to study supernovae as part of the Palomar Transient Factory survey. The survey is going quite well with over 1,110 supernovae discovered so far. Iair also manages to find the time to do some nighttime photography with his digital SLR camera. I have posted some of his work here before (See his shot of the Milky Way over the Hale Telescope, his 2 Nights at the Palomar Observatory video and his composite of the Perseid meteor shower). He managed to shoot some more dramatic images of our Palomar Skies just this last week. Both images nicely show off our domes, the heart of the Milky Way Galaxy and how light pollution is brightening our skies. This image shows the dome that used to house the 18-inch Schmidt, Palomar's first telescope. The constellation of Scorpius can be seen just to the left of the dome. Note the bright sky glow to the southwest. The 18-inch Schmidt is now retired but in its lifetime it was used for a tremendous amount of important work. For instance, just yesterday was the anniversary of that telescope being used to make the 1992 discovery of asteroid Braille (1992 KD). Astronomers Eleanor Helin and Kenneth Lawrence found the asteroid as a part of the Palomar Planet-Crossing Asteroid Survey. Just seven years later Braille was photographed as NASA's Deep Space 1 spacecraft flew past it. 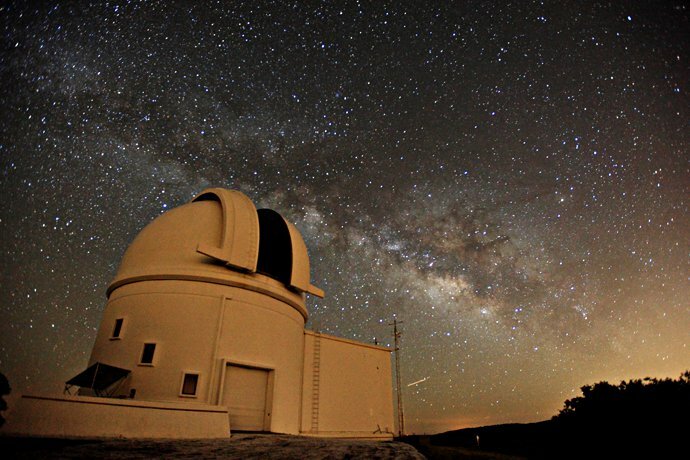 Another of Iair's photos shows the Milky Way behind the dome of Palomar's automated 60-inch telescope. The 60-inch telescope is used nightly to perform follow-up observations on the new transient sources discovered through the Palomar Transient Factory survey. It also is a rapid-response telescope that gives astronomers a look at the optical glow of gamma-ray bursts.